The flower stamp is Hero Arts E3132 Dots in a Flower. Happy Birthday is from Woodware FRCL069 Large & Small Greetings. 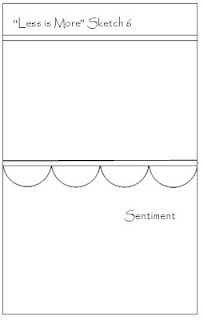 Martha Stewart punch for the frilly bit. Love this bright, simple card - it's so effective! Love the dots in the flowers and the border! This is gorgeous! I love the bold color combo and fabulous job with that sketch!!! What a wonderfully vibrant card, it's a great take on the sketch! This is a super cute CAS card, and I just love how you've made the colors POP!! Great job on this one. 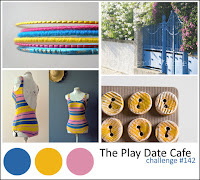 I also played along at Play Date Cafe, and I'd love to have you stop by and take a peek. If you are interested in a new follower, I'd love to follow you and have you follow my blog as well. I also have a challenge blog if you have time to link up - your cards are beautiful and would be perfect in our challenges as well. Have a blessed week, and I hope to see you soon! Fun and bright card ... love that the dots are repeated in the flowers and the border. The gems add a nice detail to the flowers. Great colour combo - lovely and bright!